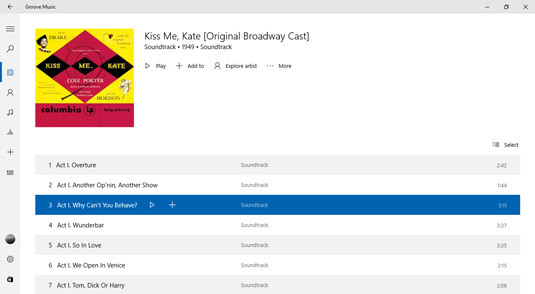 Your Windows 10 laptop has many options for allowing you to access your favorite tunes. First, locate the Groove Music tile in the Start menu on your laptop. Open the Groove Music app by clicking the Groove Music tile in the Start menu. The Groove Music app opens with a view of the albums in your collection. Click a library tab such as Artists or Songs; the library contents appear. If you choose Albums or Artists, click an item to show a list of songs. Click a song and then click the Play button that appears. Click the Play button to play a song. When a song is playing, this button changes to the Pause button. Click the Next or Previous button to move to the next or previous track in an album or playlist. 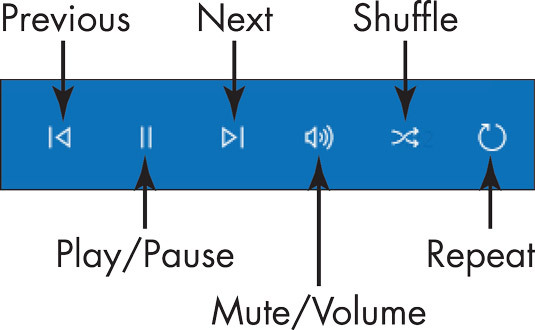 Use the Mute/Volume control to pump the sound up or down without having to modify the Windows volume settings. Use the Repeat button to repeat an album or playlist. Tired of the order in which your songs play? You can click the Shuffle button (it sports wavy arrows) to have the Groove Music app move among the songs in your album randomly. Click this button again to turn the shuffle feature off. To jump to another track, rather than using the Next and Previous buttons you can double-click a track in a list in the Groove Music app. This can be much quicker if you want to jump several tracks ahead or behind the currently playing track.